The Kinesio Taping Method is a rehabilitative taping technique which facilitates the body’s natural healing process. Designed by Dr Kenzo Kase in Japan more than 25 years ago, it provides support and stability to traumatised muscles and joints without restricting the body’s range od motion. Kinesio taping is used successfully to treat a variety of orthopaedic and neuromuscular conditions, from plantar fasciitis, ankle and knee sprains, lower back pain, to shoulder and neck muscular strains. By targeting different receptors within somatosensory system, Kinesio tape alleviates pain and facilitates lymphatic drainage by microscopically lifting the skin. This lifting affect forms convolutions in the skin thus increasing interstitial space and allowing for a decrease in inflammation of the affected areas. Kinesio taping prolongs the benefits of manual therapy administered within the clinical setting, reduces the pain, optimizes performance, prevents injury and promotes good circulation and healing . We are using latex-free Kinesio tapes which are wearable for days and are safe for populations ranging from paediatric to geriatric. 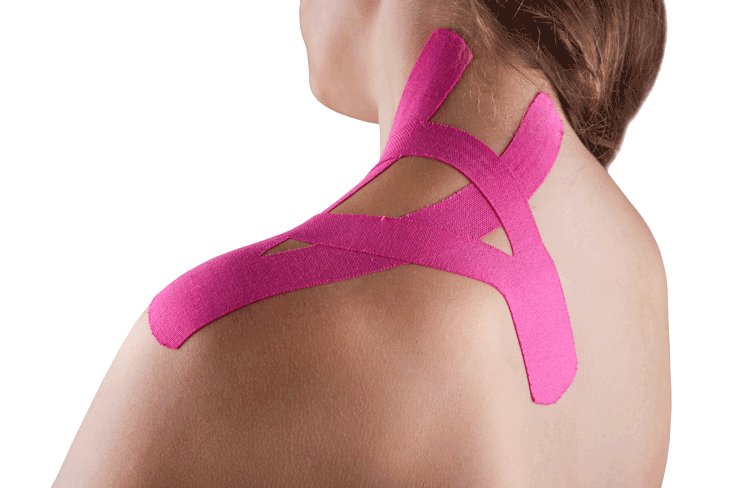 Rather than being wrapped completely around injured joints or muscle groups, kinesiology tape is applied directly over and/or around the periphery of these areas. This non-restrictive type of taping allows most applications to be worn for 4-5 days, allowing therapeutic benefits to accumulate 24/7 for the entire time they’re worn.